We raise only All Natural Heritage Berkshire Hogs that are known for outstanding flavor compared to the bland flavor of commercial breeds used by large-scale pork producers. 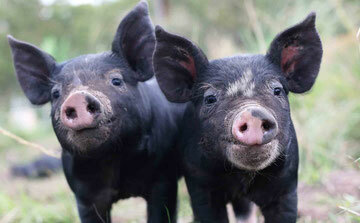 Heritage breeds were popular before World War II, when pigs were raised outdoors on family farms. Because of the exercise they got and the fat they needed to get through winters outdoors, heritage breeds produced pork that was perfectly adapted to their outdoor environment. Raised Naturally Outdoors on Our Family Farm. Heritage breeds are prized for juiciness, flavor and tenderness. The meat is pink-hued and heavily marbled. Many Americans have only experienced store bought pork from CAFO (Confined Animal Feeding Operation) raised pigs. 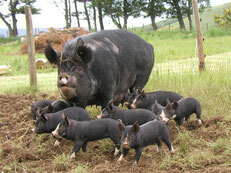 Big Agriculture engineered new pig breeds that fit the factory farm model. They developed pork they could market as “the other white meat”. CAFO raised pork is lower in fat but tasteless and tough, these new industrial breeds could not live in a pig’s natural environment. CAFO raised pigs require the heavy use of antibiotics and growth hormones because they are so closely confined. Most factory raised pigs never see natural daylight.